Unlike other so called "Ginger Beers" Fentimans' process starts with fermenting the finest chinese ginger root. This goes a long way to explaining the wonderful Ginger "Burn" that each bottle contains. All natural and made in the time honoured tradition, using the finest Chinese Ginger Root, it is their best known product and enjoys a growing following around the world. 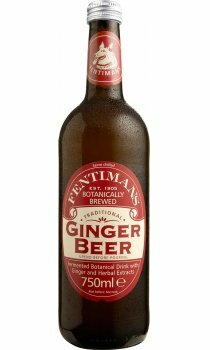 If you like Ginger, you will love Fentimans Ginger Beer!